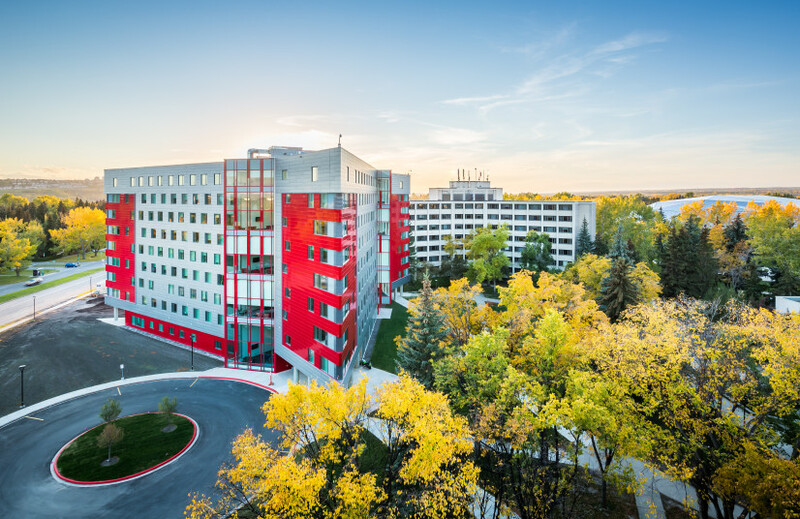 The building is a nine-storey, plus basement, triangular design situated on the southwest quadrant of the main campus surrounded by 1,000 beautiful aspen trees adding to the green, lush landscape in the area. Connected to the Dining Centre and the Residence Services office through an underground tunnel system, students can go virtually anywhere on campus without going outside - perfect for winter! A wide-range of activities and events are organized for residents, ranging from excursions to the famed Canadian Rockies, to community BBQs, road hockey tournaments and more! 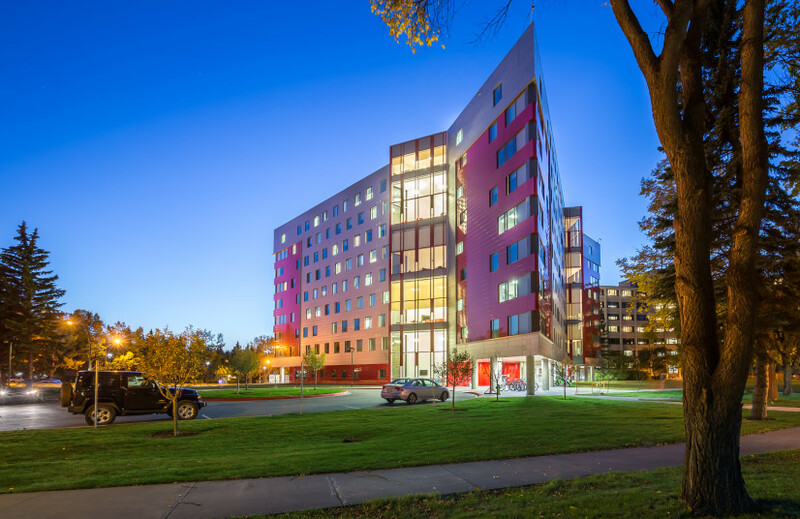 Mentoring, academic support programming and leadership opportunities will be available to all students living in Aurora Hall. The two residences were completed in 2015 under a design-build contract led by CANA Construction. NORR/Dialog were the project architects, and mechanical and electrical services were provided by MCW Hemisphere Ltd. 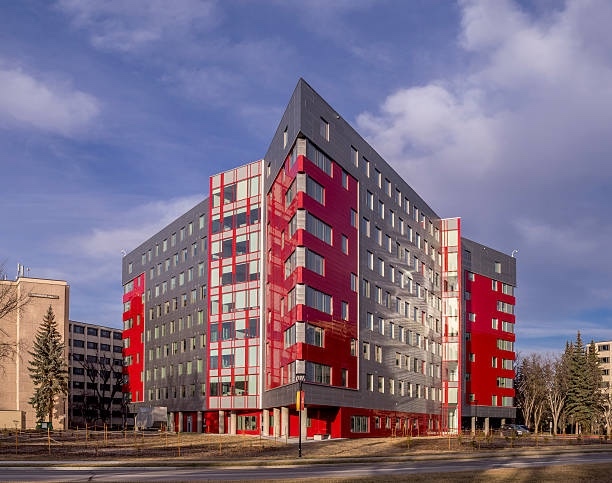 The building is energy efficient and designed to meet The Leadership in Energy and Environmental Design (LEED) Gold certification – an internationally recognized rating system assessing the environmental sustainability of building designs. Flynn Group of Companies installed 36,500 sq. ft of membrane and metal roofing, in addition to 130,000 sq. 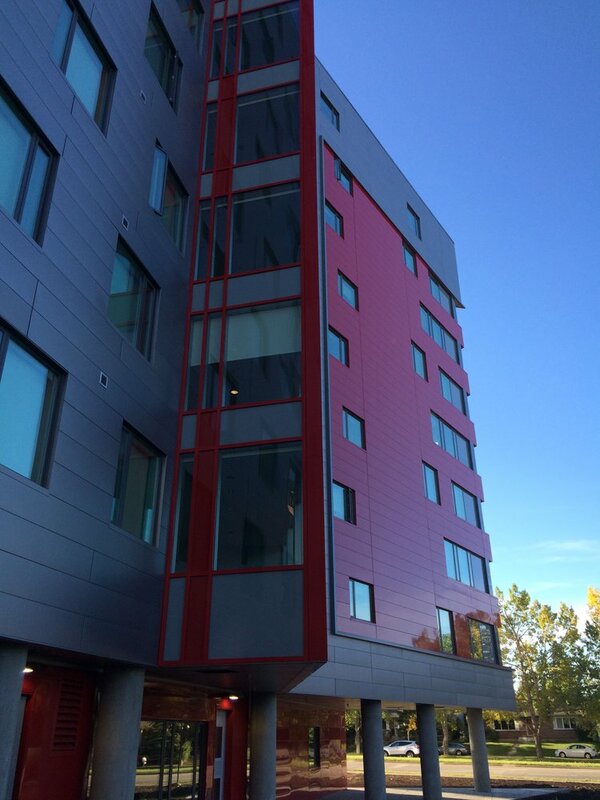 ft of Kalzip FC 30/400 facade systems and ACM panels. 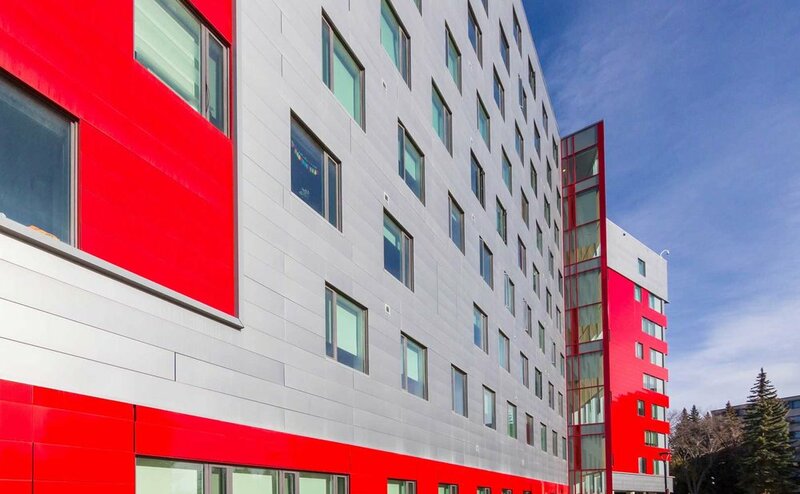 Utilizing colour in architecture isn’t always as easy as it may seem. If not done tastefully, the use of colour can make a project look tacky and can quickly appear outdated. 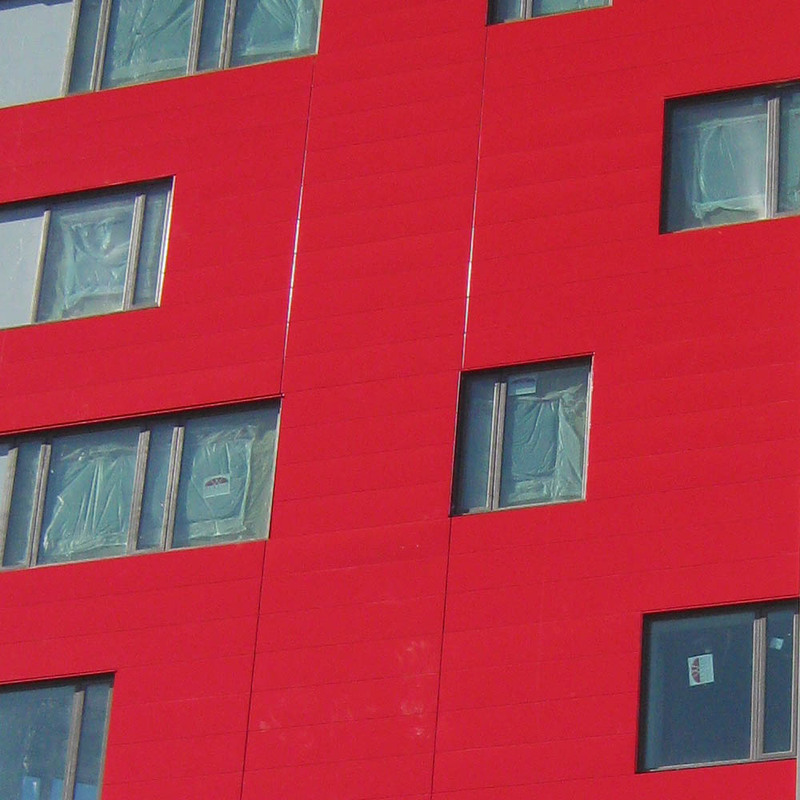 NORR and Dialog, however, were up for the challenge incorporating red ACM panels contrasted with stunning mill-finish Kalzip FC 30/400 for a facade that is representative of the school colours. Ultimately, NORR and Dialog architects designed a building that is unique, purposeful, and true to the schools heritage. For other great projects and content, visit our Instagram.